In the Middle Ages, a fair amount of thought went into the list: who was an example of virtue and valour; whose chivalry was worth emulating? Suppose I asked you to name the world's great heroes? (For example, as you may recall, some talk of Alexander.) Well, in the Middle Ages, a fair amount of thought went into the list. Who was an example of virtue and valour; whose chivalry was worth emulating? The Worthies are divided into three groups of three: three Jewish heroes, three Christian heroes, and three pagan heroes— that is, pagan in the old sense of not following an Abrahamic religion. Godfrey of Bouillon, who became the first crusader king of Jerusalem (but disclaimed the title). I am particularly interested by the heraldry. 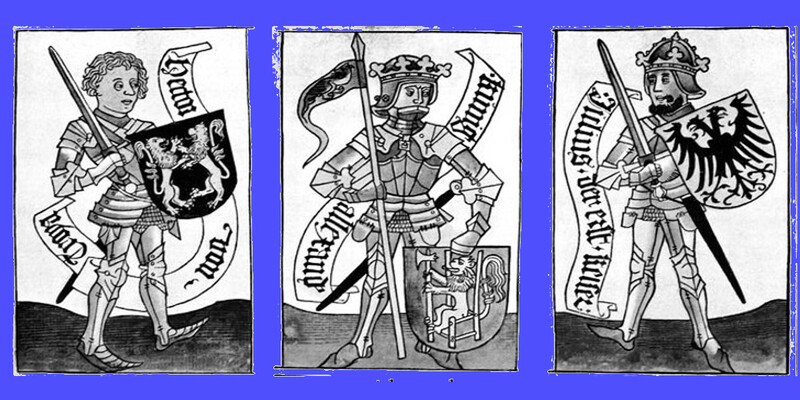 How did they make up new and unique coats of arms for people who had been dead for three thousand years? David has a harp because he composed psalms (and not because he was king of Ireland). Julius has an eagle rather like the one on the Roman standard; Charles has the same, appropriately for someone who was also trying to become Emperor of Rome, but combined with the lily pattern known as "France Ancient". Others of them are baffling to me: what is Joshua bearing, for example? I did find a reference to the arms they made up for Alexander in a book, but frustratingly I ran out of time to research this. I am glad to report that there were also nine female Worthies to balance out the nine men. Unfortunately none of the writers seem to agree about which nine women they were.